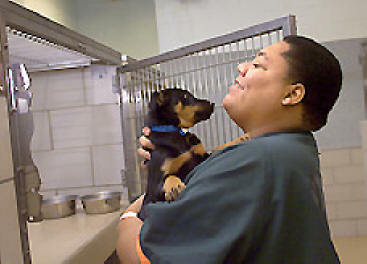 ''I've always had a soft spot in my heart for animals,'' says Lajuane Crenshaw at the Metro Animal Services. Staff WriterA Metro jail program that allows some inmates to care for neglected and abused animals is showing early signs of success, the Davidson County sheriff's office said. The Time to Paws program gives inmates some of whom are jailed on charges of domestic violence the chance to care for animals that have been beaten, starved or neglected by their owners. In turn, officials say, the inmates learn compassion and responsibility and receive a constructive outlet for their energy. The program, a year old this month, also is having a positive if early effect on the inmates' recidivism rate, officials said. ''I hate to say it: This time being incarcerated has really changed my life,'' said Chuck Davis, a program participant who was jailed for threatening his wife. Davis said he had been repeatedly arrested for drunken driving. He said the program ''takes being incarcerated out of my mind'' and that he would like to adopt some of the animals when he is released from jail. Inmates at the Correctional Work Center, a minimum-security jail in south Nashville, work with animals at Metro Animal Services, which is near the center. Four days a week, inmates go to the shelter to clean the cages of dogs, cats and other would-be pets, feeding them and teaching some of the most frightened ones to once again trust humans. Becky Levy, program monitor for Time to Paws, said inmates with a history of domestic abuse particularly learn from their wards. ''They raise their hands, and they see an animal cowering in a cage, and I say, 'That's how your family feels around you,' '' Levy said. The program has been a real benefit to the animals as well, said Davidson County Sheriff Daron Hall, who conceived the program based on working six months in an Australian jail that put animals in prison cells. ''We've seen the animals learn to trust and have comfort with people in the world,'' Hall said. Not all of the participants in Time to Paws are domestic abusers. Most have gone through jail programs such as the Sheriff's Anti-Violence Effort (SAVE) for domestic abusers and New Avenues, a state-licensed drug and alcohol treatment program. Many of the participants have not been rearrested in Metro. Hall said it was too early to tell whether the declining recidivism rate would hold up over time. In the last year, 56 minimum-security inmates have gone through the program, and nine of them have been rearrested in Davidson County, the sheriff's office said. There has never been an escape. The recidivism rate for inmates who have gone through SAVE is 44% and 50% for New Avenues, the alcohol and drug treatment program, said sheriff's office spokeswoman Karla Crocker. The recidivism rate nationally is 65%, she said. The benefits go beyond staying out of jail, Hall said. Inmates who care for animals tend to behave better while they are in the jail. ''It costs money if we have to fight and wrestle with these guys in the jail,'' Hall said. The inmates have nurtured dogs, cats, snakes, a goat and a horse, among other animals, and they're caring for an emu caged outside behind Metro Animal Services' Harding Place facility. They unload hundreds of pounds of pet food, walk dogs and keep the animals clean. They could be seen cradling the creatures and giggling and cooing at them last week. ''I've always had a soft place in my heart for animals,'' said Lajuane Crenshaw, who said he was in the jail on a drug-related charge. Shelter officials say that by getting some animals to love people again, the inmates could reduce the number of animals that are destroyed each year because they are not adopted. Adoptions at Metro Animal Services have gone up 728% since 1999, she said.